Good for backyard BBQs and dinner parties alike. With BBQ steak or steak tartare. Good with meat. Meat. Wine. Good. Simple. And of the highest quality. Like a lakeside hike in the woods, or an elegant engineering solution. Simple like you. You know your way around a grill and a toolbox. But you're no Neanderthal. You're sharp, sharply dressed and socially savvy. 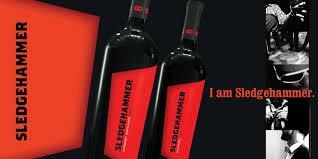 You're the Sledgehammer man. Refined. Uncomplicated. Let's put a stake in the ground and a steak on our plates as we answer every burning question about manhood. And hammer it home. It wasn’t that long ago when leaders of men would raise a glass of wine to celebrate the conquest of enemies, the reaping of the harvest, or the construction of cities. Men would acknowledge their accomplishments by toasting, laughing, and singing. They would eat heartily and drink wine liberally.